Do you experience frequent sinus infections that do not clear up with medication? More than 350,000 patients worldwide have been treated safely since 2005. Patients show significant improvement in sinus symptoms and overall well-being in the 2 years following surgery, according to studies. Though each patient will experience variation, patients typically return to normal activity and work within a couple of days. The procedure does not require incisions or the removal of bone or tissue. 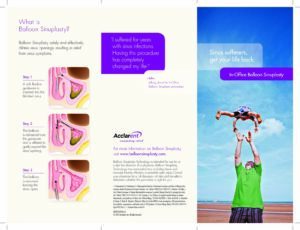 When appropriate, Dr. Ganc offers the added precision of image guidance to in-office Balloon Sinuplasty. Dr. Ganc is one of the few sinus specialists in South Florida with in-office access to this technology. 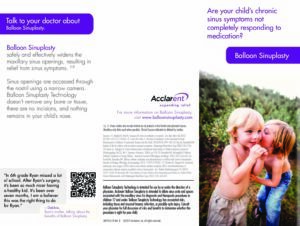 For more information about Balloon Sinuplasty, a creation of Acclarent (a Johnson & Johnson company), visit balloonsinuplasty.com.